November 30 (Wednesday at 7:00 p.m.) Music Moved Us: A Look Back at Oberlin High School's Billingsley Bands of the 1960s. The music moved the marching band down the field-lickety split. Musicians' fingers moved rapidly to conquer the difficult concert music that earned Oberlin's small-school band top ratings even when competing against much larger schools. The bands moved participants and community members to a sense of pride - and their success even moved some to jealousy. 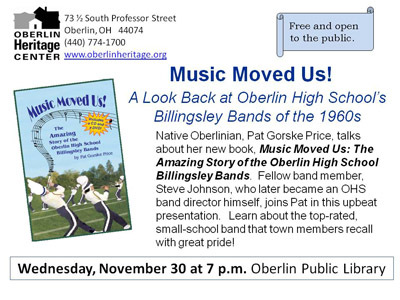 Native Oberlinian Pat Gorske Price has written about it all in her new book, "Music Moved Us: The Amazing Story of the Oberlin High School Billingsley Bands." Steve Johnson, former Oberlin High School Band Director, was perhaps the most important legacy from those bands. The two former band members and retired OHS teachers join together for this presentation. Location: Oberlin Public Library. Free and open to all.